So now, through the personal funded ratio calculation, you have an idea of where you are, relative to your target. What if you’re above your target? Or below? How does that affect your lifestyle options? Once I got used to the idea of a personal funded ratio, it seemed natural to interpret it, to give an intuitive idea of what the funded ratio could achieve for someone. In time I developed a framework that mentally divides wealth into four pots; but as the concept of pots is already established, I changed the framework to that of a building with many levels. If you have no ability to earn income from work, then the levels in the building define where you are now. If you have some years to go before your work income ceases, then you have the opportunity to rise in the building. Start with the basement. Most people have some pre-annuitized wealth, by which I mean wealth that already comes packaged as lifetime income: a national Pillar 1 pension plan (such as America’s Social Security or the Canada and Quebec Pension Plans or the UK state pension), some form of national protection against medical costs, perhaps a defined benefit plan, a lifetime annuity, or whatever income source lasts for life. Some of it may be inflation-proofed, some of it may not be. This is wealth we tend not to count explicitly, because it is difficult to estimate its present value. But it is very important. In many countries, this already-annuitized wealth accounts for the bulk of post-retirement income for large segments of the population. I place it in the building’s basement precisely because it isn’t visible, yet it’s the foundation of our retirement wealth. Next, the wealth that’s visible, the amounts we took into account in calculating our personal funded ratio in post # 46 ( https://donezra.com/46-your-personal-funded-ratio/ ). Remember the target lump sum we need to fund, that will enable us to continue our desired lifestyle for as long as we live? I divide this into two parts. One is the target lump sum for the bare essentials of life. The other is the remainder of the target, the portion necessary to preserve our full desired lifestyle. The ground floor of the building, which I call the Essentials Zone, has a ceiling at the point where there’s enough to lock in that essentials-maintaining target. And the next floor up is the Lifestyle Zone, and its ceiling is at the point where there’s enough to lock in the full desired lifestyle target. Another way to express the height of these ceilings is that they’re the wealth levels at which the essentials of life are 100% locked-in funded and at which the full desired lifestyle is 100% locked-in funded. Let’s think about the choices that people have in these zones, and the zones I’ll define above them. For those who live in the Essentials Zone, they don’t have enough money for the essentials. It’s likely (and sensible) that they hold an emergency cash reserve before thinking of anything else. And then they will rely on some form of social assistance. Sadly, in this zone, the residents don’t have the luxury of choice. In the Lifestyle Zone you have enough for essentials but not enough for your full desired lifestyle. Yet that means you do have some flexibility. And you have a choice: you can buy a lifetime income annuity to lock in the highest level of lifestyle possible, even though it isn’t as high as you desire; or you can forgo longevity protection and take investment risk, in the hope that the resulting return will grant you a better lifestyle. There’s no right or wrong choice (except in retrospect! ): it’s just a matter of your approach to risk tolerance. What about bequests, if you’re in the Lifestyle Zone? That depends on your priorities. Remember the three approaches we discussed in post # 47 (https://donezra.com/47-inheritances-and-bequests/ )? You can ignore bequests during your lifetime. If there’s anything left after your “estate event,” that forms the basis for the bequests mentioned in your will. If not, there are no bequests. Or second, set aside a specific amount now, that you want to ensure is available for bequests. (This may, for example, be your home.) Or third, it may be possible for you to buy a life insurance policy (a second-to-die policy, if there are two of you), the proceeds from which will go to your choice of beneficiary. In this case, the premiums for the policy become part of your essentials or your lifestyle (depending on the priority you assign to it), and will influence your target. Notice that in the second and third ways you still have room for bequests; in the second way you sacrifice a lump sum, in the third way you sacrifice income. All in all, in the Lifestyle Zone you have choices – indeed, you have more choices than in any other zone – but they’re all difficult choices because every choice you make in favor of one goal necessarily moves you away from another goal. There just isn’t enough wealth to do it all. Above the Lifestyle Zone you have a surplus of wealth relative to your lifestyle, and you’re in what I call the Bequest Zone. At first I thought of it as the “investment and risk zone,” because that’s what enables the owner to maintain a full investment portfolio, and of course it’s always subject to investment risk. But my wife reminded me that if we get there, it’s really the “kids’ zone,” because after we’ve gone that’s what the kids will inherit. We like our kids. Very much. And we want to leave them a legacy, if we’re in this zone. The psychological difference in the labeling came when I realized that we’d be playing with those assets in making investment choices. It’s their risk and their reward, and so we want to consult them if we get there. Oh yes, just to formalize it, I generalized the name and now think of it as the Bequest Zone. One consideration that is likely to be relevant is the impact of taxes when your estate event occurs. Laws vary around the world, and in some jurisdictions there are no taxes triggered by the estate event. But where there are such taxes, often they differ according to the form in which the assets are held (for instance, in the form of the proceeds of an insurance policy). It’s as if the state says, “We’ll tax assets in your right-hand pocket differently from assets in your left-hand pocket.” Clearly it makes sense, in some circumstances, to transfer assets from one pocket to another. That’s another area in which a financial professional can help. I deliberately place a ceiling on the Bequest Zone, or perhaps it’s more accurate to call it a floor for the Endowed Zone. That’s the point at which you can live on the investment return alone, so you never actually decumulate. You continue to accumulate forever. You don’t have to do anything different with money in the Endowed Zone, relative to the uses to which you put the money in the Bequest Zone. 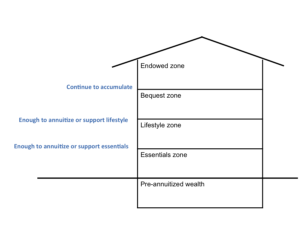 It’s just a conceptual difference: in the Bequest Zone you are actually decumulating, even though you won’t run out of money before you run out of life, whereas in the Endowed Zone you don’t decumulate at all. Dr Statman has a fascinating way to describe the position in which you find yourself. It’s a little different from mine, but it’s broadly consistent with what I’ve just defined, and he goes further in explaining some of the paths that people may have followed in getting to their post-retirement financial positions. Here’s what he says. He starts with the top. He calls them simply the wealthy. They earn more than adequate incomes during their working years, and their accumulated savings are large enough to assure no retirement worries. Below them come the steady middle. They earn adequate incomes steadily throughout their working years and save enough for adequate retirement spending. Indeed, many among the wealthy and the steady middle are members of the “millionaire next door” group, frugal people earning steady incomes who believe that financial independence made possible by savings is more important than lavish spending. Below them are the precarious middle. They consist of two segments, the low-earners and the high-spenders. The low-earners strive to save from their low earnings during their working years but their meager savings place them precariously close to poverty and inadequate retirement spending. High-spenders spend their adequate incomes during their working years, failing to save enough for adequate retirement spending. And finally there are the poor. They earn inadequate income throughout their working years, rendering them unable to save much for adequate retirement spending. I think that corresponds roughly with my Endowed Zone, Bequest Zone, Lifestyle Zone and Essentials Zone citizens. Since the options and choices are so different in the four zones, it makes sense to establish as early as possible which one you’re currently in, so that you can get used to the choices you face, and you have longer to think about how you want to make those choices. Or, of course, so that you can revel as early as possible in the freedom that comes from being above the Lifestyle Zone. And it really is a joy to get that sense of freedom. As anecdotal evidence, I once explained the zones (actually, in those early days I referred to four buckets of money rather than four zones) as a guest speaker at a financial professional’s “client appreciation night.” A lady approached me afterwards and thanked me, saying it was the first time she had been out since her husband’s death, and she was afraid that it might be depressing to talk about planning for late in life, but she enjoyed the talk. The next day I visited the professional, and lo, there was the lady again, having consulted her professional first thing in the morning. A huge smile appeared on her face when she saw me, and she said: “I just had to find out. I have four buckets!” Yes, the realization is a pleasure, at any level of wealth. Note also that, just as your personal funded ratio will change periodically as markets move and as your circumstances change, it’s also possible that the wealth zone you’re in will change. Of course, it’s terrific to rise up a zone. But the one thing you want to be aware of is if you actually fall down a zone, say from the Bequest Zone into the Lifestyle Zone, or worse, from the Lifestyle Zone into the Essentials Zone. Either would constitute a wake-up call (https://donezra.com/13-teachable-moments-and-wake-up-calls/ ). So remember to recalibrate periodically. It’s useful to find out which “wealth zone” you’re in, because your practical choices vary a lot from one zone to another. So the earlier you know, the longer you have to think about your choices. Ezra, Don, Bob Collie and Matt Smith (2009). The Retirement Plan Solution: The Reinvention of Defined Contribution (John Wiley & Sons, Inc., Hoboken, NJ). Statman, Meir (2017). Finance for Normal People: How Investors and Markets Behave (Oxford University Press, New York, NY). Thank you for the great insights Don! Your ideas match up incredibly well with the pro bono work our group has been doing since 2013, and I’d like to ask permission to share it with my connections on LinkedIn. Please let me know, and if you’d like to learn more about our experiences trying to change retirement advice I’d love to connect with you! Thanks for introducing yourself and your group’s terrific work — we do indeed seem to be coming from the same place. I’d be delighted to help in any way I can, including via LinkedIn.